The distinctive Mazda6 is an immensely popular midsize sedan that offers a comfortable, high-end interior, a fun and agile driving experience and top-notch safety features. This model year, the Mazda6 gets a full set of one-touch power windows, as well as newly standard keyless entry/ignition on the Touring trim. The sedan also gets a new optional package that offers satellite radio, a sunroof and an upgraded sound system. 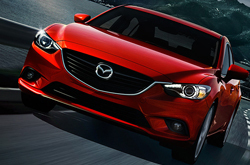 The 2015 Mazda6 in Springfield comes in three trim levels: Sport, Touring and Grand Touring. The base Sport trim offers 17-inch alloy wheels, cruise control, a 3.5-inch display, a six-speaker sound system, cloth upholstery and a manual gearbox. Choose the optional automatic transmission and you'll add a rearview camera, Bluetooth connectivity, a 5.8-inch touchscreen and several audio system upgrades, including a text message display function and HD radio. The next level Touring trim adds 19-inch alloy wheels, dual-zone automatic climate control, a sliding console armrest, keyless entry/ignition and leatherette upholstery. Touring models equipped with automatic transmission also get a few upgrades through an available package, including an upgraded 11-speaker Bose audio system, satellite radio and a sunroof. The top tier Grand Touring trim adds a set of unique 19-inch alloy wheels, adaptive bi-xenon headlights, foglights, driver memory function, leather upholstery and heated front seats. Our 2015 Mazda6 review recommends the GT Technology package if you're looking to add even more luxury features and amenities to the Grand Touring model. 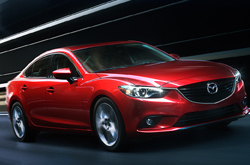 The Mazda6 is powered by a 2.5-liter four-cylinder engine that rates at 184 horsepower and 185 lb.-ft. of torque. Power is funneled through either a manual or automatic six-speed transmission. Safety features on the Mazda6 includes traction and stability control, full-length side curtain airbags, active front head restraints and antilock disc brakes. Optional safety features include Mazda's Smart City Brake Support system, forward-collision warning and lane-departure warning. 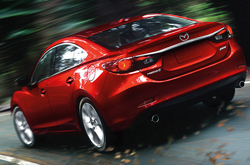 Stop by our showroom today and take the new 2015 Mazda6 in Springfield for a test drive. For more information about this terrific family sedan, keep reading our 2015 Mazda6 review for model pics and a video review! 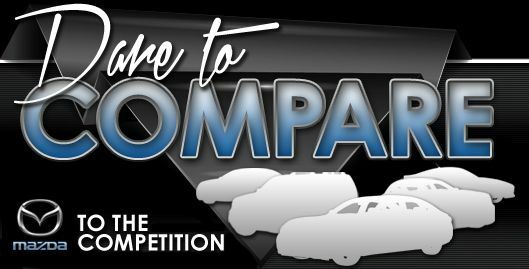 When you compare Mazda's new 2015 Mazda6 next to the 2015 Honda Accord, Toyota Camry, Nissan Altima and the Ford Fusion, we're sure you'll find that the Mazda6 is the perfect fit for you. MO shoppers will be thankful for the Mazda6's leading-edge features and inexpensive price. It's a fantastic value. Just compare its price to the vehicles in its segment and you'll surely see why so many Springfield drivers love it. The bullet list under this text will give you even more info! Welcome to the Reliable Mazda review of the new Mazda6. After reading our overview above, if you decide the Mazda6 isn't the best vehicle for your commuting needs, please check out other 2015 Mazda reviews in our research gallery. We're a top-rated car retailer in Springfield for a reason, part of which is that we provide reviews written by expert writers who are at the height of their craft. Filled with important facts and specs, including cargo capacity and other info, each section gives you full access to everything Mazda's lineup has to offer. After viewing Reliable Mazda's review of the new Mazda6, phone us to make an appointment for a test drive and find out about exclusive offers!